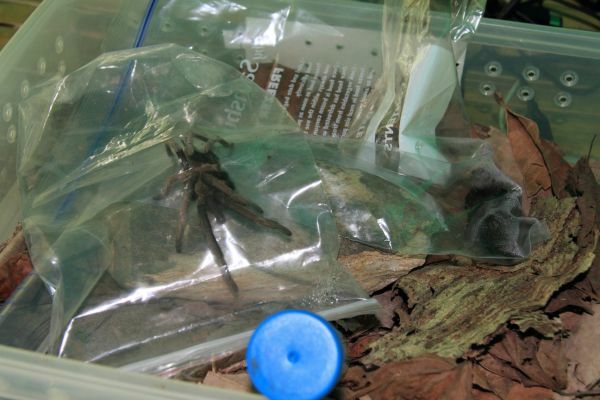 Spiders collected in Papua New Guinea for future research. Photograph by David Williams. PhD student Dalia Ponce studied jellyfish venoms, which are rich sources of bioactive compounds; however few toxins have been completely isolated and characterized. The Scyphozoans, or ‘true’ jellyfish, have been somewhat neglected for toxin studies, compared to the more dangerous box jellyfish. Proteomic, transcriptomic and pharmacological studies are essential to identify and isolate toxic proteins/peptides as well as to elucidate their structures, mechanisms of action and molecular targets. Dalia’s basic research investigating the proteomes of jellyfish venoms may lead to the discovery of promising compounds for the development of therapeutic agents or probes to study physiological pathways. In collaboration with the Cardiovascular Therapeutics Unit, the Tennessee Aquarium, the Australian Institute of Marine Sciences in Townsville and the Queensland Institute of Medical Research in Brisbane, Dalia worked with venoms from the Atlantic sea nettle, Chrysaora quinquecirrha, and the Pacific sea nettle, Chrysaora fuscescens, in order to explore the proteomics and transcriptomics of each venom and characterise the pharmacological activities of crude venoms and isolated toxins using in vitro and in vivo bioassays. Ponce, D., Brinkman, D. L., Potriquet, J., Mulvenna, J. 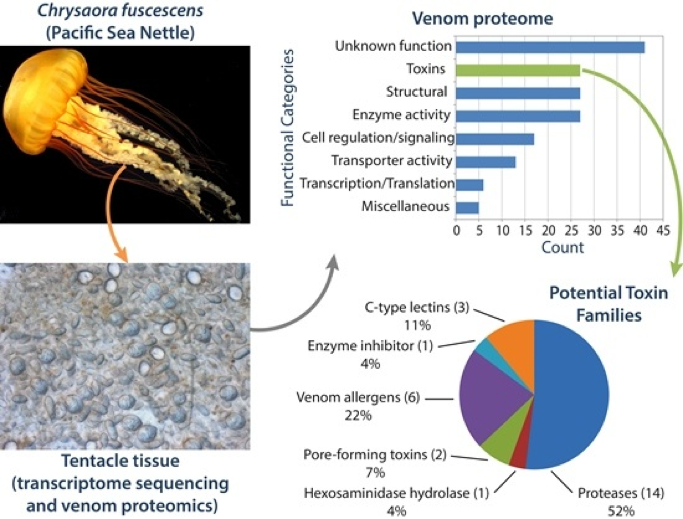 (2016) Tentacle transcriptome and venom proteome of the Pacific sea nettle, Chrysaora fuscescens (Cnidaria: Scyphozoa). Toxins 8: 120. Ponce, D.; Brinkman, D.L., Luna-Ramírez, K., Wright, C.E., Dorantes-Aranda, J.J. (2015) Comparative study of the toxic effects of Chrysaora quinquecirrha (Cnidaria: Scyphozoa) and Chironex fleckeri (Cnidaria: Cubozoa) venoms using cell-based assays. Toxicon 106: 57-67. In 2014 AVRU PhD student Karen Luna-Ramirez completed work on the venom of Australian scorpion venoms. The antimicrobial activity of certain peptides in scorpion venom were examined, and some were found to have broad spectrum antimicrobial activity against Staphylococcus aureus ("golden staph") including multi-drug resistant strains, indicating a potential use of these peptides as drug leads in the fight against gram-negative multi-drug resistant infections. The research also enabled the structural and functional characterisation of a potassium channel toxin present in the venom of the inland robust scorpion (Urodacus yaschenkoi) from arid Australia, and proteomic and transcriptomic analyses of scorpion venoms combined with functional assays and structural modelling made it possible to describe this toxin for the first time. Luna-Ramírez K, Bartok A, Restano-Cassulini R, Quintero-Hernández V, Coronas FI, Christensen J, Wright CE, Panyi G, Possani LD. Structure, molecular modeling, and function of the novel potassium channel blocker urotoxin isolated from the venom of the Australian scorpion Urodacus yaschenkoi. Mol Pharmacol. 2014. 86(1):28-41. Luna-Ramírez K, Sani MA, Silva-Sanchez J, Jiménez-Vargas JM, Reyna-Flores F, Winkel KD, Wright CE, Possani LD, Separovic F. Membrane interactions and biological activity of antimicrobial peptides from Australian scorpion. Biochim Biophys Acta. 2014. 1838(9):2140-8.